​Based in the Blue Mountains of Australia Linda is known for her ethereal, fantasy watercolours and her ability to capture the beauty of nature with a touch of surrealism. 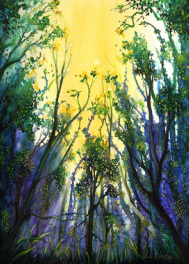 Being multi-talented, Linda creates a diverse range of works in different mediums, to bring joy and inspiration to her viewers and awaken their imagination, taking the ordinary and adding enchantment and light. As an Award Winner Linda is honored that over 100 originals have found new homes and hundreds of products have been shipped worldwide from her online Redbubble gallery and studio since beginning her art journey in 2008. 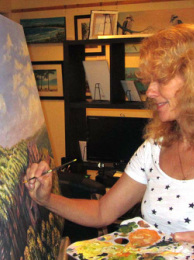 Linda has held successful solo shows, been featured in numerous magazines, and many of her paintings, including commissions, are held in public and private collections nationally and internationally. You can view and purchase originals and products at Lindart Studio/Gallery (0414586028 - ring for appointment any time) or buy securely online, and at a wide range of art exhibitions. PLEASE CLICK BLOG for photos, sales, news and to keep up to date with what's happening! Please sign up and 'Follow' Linda to keep up to date with new works. Browse and purchase Linda's latest artworks securely online at her Redbubble Gallery. Here you can order quality reproductions as scarves, leggings, cards, on canvas, framed prints, bags, i-phone, i-pod, and i-pad cases, t shirts, cushions, duvet covers, dresses, skirts, and more! Like Linda's Facebook page to view her recent projects, sales and exhibition/commission news. ​View my recently joined Society6 profile with new products available such as curtains, coasters, pillow covers and more! Copyright © 2013 Linda Callaghan. All Rights Reserved. No images to be altered or used in any way without consent of artist.